Yacht and boat manufacturing dates back to the beginnings of Sino Eagle Group company, and has remained a core business within the group since 1985. We are currently one of the only Chinese boat builders and yacht manufacturers which offers the in-depth knowledge and experience in advanced yacht building practices, and full in-house manufacturing capabilities. With our new facilities for boat building in China, combined with our skilled and experienced labor force,we can cater to all your yacht production needs, from custom and high-tech small scale yacht manufacturing, to mass production large scale yacht manufacturing projects. Sino Eagle Group is an experienced chinese yacht manufacturing company, and a premier yacht manufacturer in China, manufacturing a variety of OEM yacht brands including Aquila world class sailing and power yachts. Aquila Power and Sailing yachts represent some of the newest and most exciting boating evolutions on the market today, with leading innovation, practicality, quality and comfort. With trend setting design both inside and out and a full range of models offering various custom configurations to choose from maximizing your appreciation and enjoyment of life on the water. With an uncompromising design brief, advanced industry experience, engineering and world class manufacturing know-how, the new Aquila 36, 44 and 48 power catamarans are developing reputations as the game changers, and the new standard of excellence in boating experiences. With more manufacturers looking for cost effective offshore yacht building solutions, our newest yacht building factory facilities with waterfront access, coupled with skilled and experienced staff makes Sino Eagle Group an ideal OEM Chinese partner for international yachting and boating companies seeking more cost effective yacht building solutions. 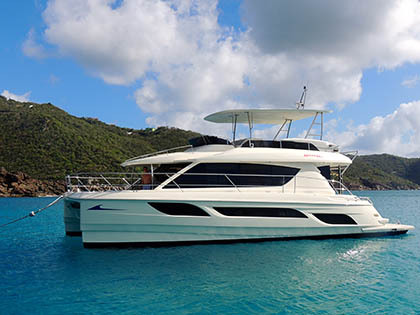 Our staff is well versed and experienced offering the highest level of workmanship in all conventional and composite yacht building and production methods including both Wet Lamination and Resin Transfer Molding. Additionally, we hold 4 patents in pre-impregated molding technologies which ensures the most optimal resin to cloth impregnation offering a considerably stronger, stiffer, lighter and greener end product than laminates produced by conventional lamination techniques. Sino Eagle Group’s yacht building projects includes a partnership project with Robertson & Caine renowned catamaran yacht builders to manufacture Leopard 38 sailing catamarans and Leopard 37 power catamarans which were placed into the global charter fleets of The Moorings and Sunsail yacht charter companies. Aside from having the boats built in China, SEG company was also responsible for expertly commissioning all the yachts for delivery under sail, without incident, to various global destinations.